MeriTALKracy | Join the discussion. What does merit mean to you? Join the discussion. What does merit mean to you? Our motto describes a clear hope: that those who have merit will be the ones rewarded with prizes and success. What I would like to propose is that the phrase only promotes a forward relationship, and not the reverse. While having merit is hopefully followed by receiving the ‘palm’, it does not exactly imply that obtaining the ‘palm’ undoubtedly marks a person as having merit. The distinction may be slight, but it is an important one, as the interpretation we use to guide our choices has a large impact on the quality and meaningfulness of our lives. Do we aim to earn victory or do we aim for victory itself? How we answer this personal question indicates what we value, and ultimately, how we define our ‘palm’. I believe that UCC encourages boys to believe in the first interpretation, that victory will come if we first attain merit and deserve it. The aim is not to create a sense of false hope to our youth, as it is clear that having merit does not always lead to success -and indeed, our motto is written in the subjunctive. Rather, the point is to promote the idea that pursuing and having merit is in itself a noteworthy achievement. Character. Value. Ethics. Integrity. Hard-Work. Honour. These are characteristics that make our lives have purpose and worth, and are indeed prizes to hold in themselves. It is not to say that there is anything wrong with chasing the ‘palm’ directly or pursuing the prize for the sake of having the prize. Certainly, obtaining a prestigious degree from a well-known school, or attaining a high paying salary, or getting a fancy job title are great achievements to have. But in doing so, we lose focus on what actually makes these prizes worthy for us to desire, and worthy for us to want to spend our lives earning. Instead, what I would encourage is valuing the experiences, opportunities and abilities we gain from our education, not the title or institution listed on our the degrees. It means focusing on the positive changes we make through our jobs to deserve that great salary, not the salary amount itself. Subsequently, it means prizing the personal connections that we have, the knowledge that we gain and the joy we are able to impart to others, rather than the material goods we accumulate. At UCC (and in all schools), we are taught by selfless teachers, who by definition give their lives to encourage this message. Their goal in life is to share knowledge and encourage good values, and this very act, signifies their merit, and also acts as their prize. Understanding this, it is puzzling to see graduates chasing victory without attempting to earn it first and without knowing why it is they seek it. Ultimately, if we aim to obtain these prizes directly, we become disillusioned to believe that having these prizes is enough. But if we live by the ideals that UCC imparts, we understand that there is no definitive ‘palm’ to obtain. It is through an ongoing, lifelong pursuit of merit, integrity, and character that makes us victorious and accomplished. Indeed, our motto does hope that prizes come to those who simply merit it. I would also suggest we be careful when actually receiving ‘palm’ that we do not stop pursuing merit, for this is the ultimate ‘palm’ to bear. Brian Law (UCC ’07) is currently pursuing a public policy masters (MPA) at the London School of Economics and Political Science. He completed his first degree in architecture at the University of Miami, but has since made the transition into the international development sector. At UCC, he was heavily involved in the arts program, participating in numerous music ensembles, theatre productions and school publications. This entry was posted in Uncategorized on May 12, 2014 by jjacobson2012. All glory to the man who striveth fair! Oh beauty of the striving soul, and light! In hall and class-room there we sat! You stored our minds with knowledge, and THIS truth! One hundred years have gone, oh glorious past! Your influence on mind and man will last! This entry was posted in Uncategorized on March 20, 2014 by jjacobson2012. This article was published in the winter edition of Old Times in 1977. Robertson Davies on past principal, William Grant (Headmaster 1917-1935). This entry was posted in Uncategorized on March 18, 2014 by jjacobson2012. “What did ya get?” “What did ya get?” I remember a holiday party as a child where two teenage boys hopped onto the telephone in the basement after a pious meal to ask their friends what new electronic gadgets they had each received as holiday gifts. The Commodore 64 was, then, the high watermark of gift status. “All people have a yardstick against which to measure themselves against others,” a global CEO recently told me. This may or may not be true – but there are moral laws of virtue inherent in remaining silent when others boast about any manner of things: gifts, titles, vacations, their children’s grand scholarships, and so on and so forth. These are all variations on the braggadocio about telling one’s friend (whose parents may be lacking in income or job security) about receiving a Commodore 64. “We just got back from a family vacation to Hawaii. It was stunning. The kids look forward to next year. It’s an annual thing for us.” Accompanied by toothy grin. “I just went to a work-out at the Granite Club. Thank goodness I can at least mix a bit of personal time in while my son plays soccer.” Accompanied by mild scowl. “My Mercedes is in the shop. Hence the rental car. It’s old but it’ll do.” Accompanied by big hairy chip rolling off shoulder. There is no co-linear positive relationship between people who throw about absurdities such as the above and their actual wealth. Who even cares? Why? The Stoics, notably the great Epictetus, the Ancient Greek philosopher sage, said in the Enchiridion that we have a duty to be Socratic, or to openly confront or mock, people who disobey the laws of proper speech. To boast about battle or accomplishments or to reference self-aggrandizing self-importance, is to be met with shunning, or, sometimes, breezily indifferent confrontation. So the proper response to: “I just went to the Granite Club” is… “What is the Granite Club?”; or…“Why do you say that?”), or, simply, to turn your head, exit the conversation, and to avoid such people after showing a clear sign of disapproval of their speech. There is no time to deal with self-important people. Life is too short. We will all be obsolete. Just like the Commodore 64. I learned about the power of speech – and silence – from my parents, and from my years at Upper Canada College in the 1980s. Thank you to the teachers who modeled that. You know who you are. Neil Seeman is UCC Class of 1988 and his son Davey is in Form 3 in the Prep. This entry was posted in Uncategorized on December 11, 2013 by jjacobson2012. As someone who, as a student, managed to live a “palm free” existence myself, I can only marvel at the many accomplishments of those we honour this morning. For those who will not make the trip to the front of Laidlaw Hall today, I’d like to share one thing I got completely wrong when I was in high school, in the hope that you might learn from my mistake. When I saw other boys being honoured during assemblies such as this, I made the terrible mistake of thinking, “Those guys are lucky!” I would tell myself that, if my teachers were just a little more generous with their grading, if I had been lucky enough to remember the day of the math final, if Clint Eastwood week didn’t happen to fall the week of exams, then I would be getting a prize too. In hindsight, I realize that the academic prize winners were no more lucky than the lucky lad who played the lead in “Hamlet” or the fortunate fellow who played first violin in the orchestra. It’s not luck at all, of course. Their success was a combination of natural talent and will power. That will power – that commitment to work, that commitment to excellence — is what we are really recognizing today. That advertisement underlines a most basic premise: the cause and effect of life. If you want to get in top physical condition, you have to work at it. If you want to achieve success in Geography or Mathematics, you have to work at it, too, because good intentions just aren’t enough. The problem with a loose ball is that you can’t send your best buddy, your kid brother, or even Uncle Charlie in there to get it for you. You have to leave your feet. You have to do it instinctively. And you have to do it yourself. What prompts a sane person to dive on an unforgiving slab of hardwood in order to grab a leather ball? It has to take more than just desire, because a lot of folks would like to have the ball. No, what makes someone leave his feet is that combination of passion and will. No, life isn’t always fair. Effort doesn’t come with a 100 per cent money back guarantee. Occasionally you may work hard and not attain a desired result. In general, though, effort extended through a distance is the best way to merit the palm. It is the only way to get a loose ball. And it is that real virtue, whether you call it diligence, perseverance, or commitment to the task at hand, that we honour this morning. To all of those who merit the palm, congratulations! Santa didn’t give this to you. You earned it. May your good work inspire our best efforts! Appointed in 2004, Dr. Jim Power is the 18th Principal at Upper Canada College, a leading independent boys school in Toronto. Born and raised in Philadelphia, Pa., he has a Bachelor’s degree in English from College of the Holy Cross in Massachusetts, a Master’s degree in the Art of Teaching from Boston College, and an Ed.D in Educational Leadership from Boston University. He also attended Columbia University on a Klingenstein Visiting Heads Fellowship. Dr. Power started his career in independent schools in New England and taught at both the elementary and high school levels. For 11 years — and preceding his move to UCC and to Canada — he was Head of Georgetown Preparatory School, a boys’ school in North Bethesda, Md. This entry was posted in Uncategorized on October 10, 2013 by jjacobson2012. Let’s start with Palmam. These are relationships. There is no higher reward for any human being than a whole and sincere relationship. We earn relationships through our deep presence before the whole experience of other people, and our willingness to share our own vulnerabilities with other people. And to do both in a spirit of gratefulness. Robert Steiner (UCC Class of 1987) is Director of the Fellowships In Global Journalism at the Munk School of Global Affairs, University of Toronto. He began his career as a global finance correspondent for The Wall Street Journal with postings in New York, Hong Kong and Tokyo, where he was a finalist for the Pulitzer Prize, won two Overseas Press Club awards and the Inter-American Press Association Award. After leaving The Wall Street Journal Mr. Steiner worked as a business strategy executive, first at The Boston Consulting Group and later as Group Vice President in charge of Strategic Planning for Bell Globemedia. From 2005 to 2010, Mr. Steiner was Assistant Vice President of the University of Toronto, in charge of Strategic Communications. Mr. Steiner has also held a number of senior campaign positions in Canadian politics. This entry was posted in Uncategorized on May 7, 2013 by jjacobson2012. Archival issues of Old Times are available on the UCC archives website at http://archive.org/details/uppercanadacollege. This entry was posted in Uncategorized on April 23, 2013 by jjacobson2012. This video was created for UCC’s 2013 Founder’s Dinner held on Feb. 13 at the College. This entry was posted in Uncategorized on March 4, 2013 by jjacobson2012. 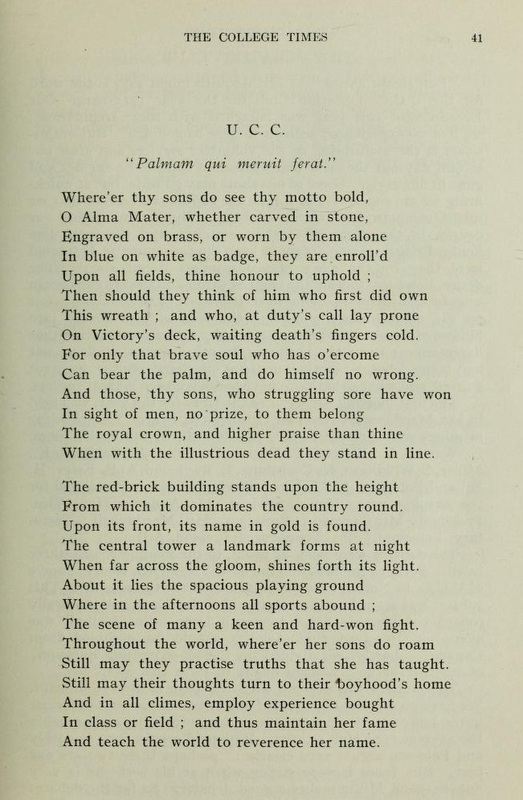 UCC poem in winter edition of College Times 1913, p.4 — click on image to view full size. This entry was posted in Uncategorized on March 1, 2013 by jjacobson2012. The moment I took my first good look at our venerable crest, I knew I was in the right place. Although I have never done a formal survey (or any inquiry at all, for that matter), I would think most people’s first and lasting association with it is the bejeweled crown. While this symbol, I assume, is a vestige of our regal ancestry, it could also just as easily represent victory, which is the unequivocal meaning of the symbol that frames it, the one that struck a chord deep within me. As a lover of competition, it is those palm branches I have always so desperately wished to bear, knowing I would only do so if I “merited” it, which is what the motto, in its jussive subjunctive mood, almost outright challenges us to do in order to gain the deserts alluded to. Thanks to Mr. De Pencier for making this clear! In my younger days, I don’t think I had any concrete notion of exactly what “merit” entailed other than it involving the winning of awards and, after reading the various interpretations of this concept presented in the previous essays, I know now that I only had a narrow and foggy one. The term is clearly a loaded one. As a number of other contributors have pointed out, the strict dictionary definition incorporating ideas like “reward” and “deserving” is subjective at best and inherently flawed, at the least. As such, talk of a meritocracy, especially with the way our society is currently structured, seems moot. The concept of “merit”, however, retains great existential value and it is truly worth fleshing out, especially as it is our guiding principle (many thanks to Mr. Seeman, et al for initiating the discussion!). The popular, perpetuated conception of “merit” as something material or titular is understandable but quite limited. As already detailed in these pages, the caprices of chance and circumstance, in and of themselves, demand the need for a deeper meaning to the word. Mr. Caylor, Mr. Laidlaw, and others have variously opined that the act of “meriting” should involve some measure of moral rectitude. I think it does indeed embody a particular virtuousness and I believe we should strive to attach a grander meaning to the concept. Then, the four simple Latin words of our motto, given the legendary Admiral Lord Nelson’s imprimatur, can buoy us even more strongly. Of all the concepts of Eastern philosophies that we have latched on to (and mutated) in the West, karma is probably the most well known. It can be good, bad, or a downright b$&@!, but in the end, according to a rudimentary understanding of it, our choices and actions determine our fate. The concept in Buddhism, however, has a broader meaning, involving intentional, virtuous action that liberates one on the path to nirvana. In fact, Buddhism provides a closely associated concept that is a result of good karma: merit (Sanskrit, punya). The Buddha outlined three bases of merit: virtue; giving, or alms; and mental development. While Buddhists want to accrue “merit” to increase their chances of a happier after-life, I think we can apply these very same precepts of merit to achieve true “rewards”, happiness and success, in our present lives. Honesty, loyalty, equanimity, love, compassion – these universal virtues are basically our community’s “Shared Ideals”. They are also the sine qua non of “merit”. To use an example already proffered, the Olympic Games – which instantly arise to mind from the image of palm branches and/or laurel wreaths – are perhaps, ostensibly, the last sporting bastion of fair play and unity, eschewing the increasingly prevailing win-at-all-costs ethos. Meriting a place at the top of the podium requires not only amazing athletic prowess, of course, but also integrity and ethics. If the boys I coach do not play fairly or win without class and sportsmanship, I do not feel we would “merit” a victory. Conversely, the Spanish distance runner who recently relegated himself to second place when he pushed the leading Kenyan man, who had prematurely stopped before the finish line unknowingly, through to the end ahead of him, most assuredly earned the right to bear the palm. No matter what the situation or the outcome, one can consider themselves meritorious if intentionally and consistently living and acting with these qualities – good karma, strictly speaking. To me, “giving” does not mean merely buying a gift card for your teacher or volunteering for Horizons. It entails sacrifice – being selfless but, in the process, giving and connecting to one’s own (sense of) self. In team sports, underdogs (or any team, for that matter) merit the palm by subjugating their egos and synergizing their talents. You cannot help erupting with goose bumps – a cosmic effect – watching today’s FC Barcelona squads, the Oilers of the mid-80’s, or the Knicks of the early-70’s. Here, merit is collective, a community-builder, but each individual, typically, also benefits in some personal, professional or, often, spiritual way. A group of people acting in harmony can become transcendent, with each person strengthening their sense of self concomitantly. Such giving, then, whether it is to your teammates, your classmates, or your family, becomes doubly victorious and truly meritorious. Cultivating one’s mental life as a basis of “merit” is especially appropriate for a learning institution’s motto that revolves around this idea. Naturally, Buddhists would characterize this aspect of “merit” as involving some sort of mindfulness or meditative concentration. While this can be helpful, as a teacher, I would interpret this even more literally. That is, engaging in and developing a deep and abiding love for learning and the process of it is more truly meritorious than just achieving a high grade. I always tell my students that the “merit” they often desire is, more often than not, a direct by-product of not only their concerted mental efforts to develop deep understanding of the content, but also directed reflection upon their own learning abilities and strategies. I believe effecting this paradigm shift frees one up to absorb material more quickly and perform at a high level, which is every student’s ultimate objective. In an individually defined way, everyone can “merit” a (learning) victory each day, no matter whether that day ends with Ivy League admission, promotion, or general recognition. We shackle ourselves unnecessarily with mundane and impersonal definitions of “merit”. Every Prize Day, Dr. Power takes pains to let the boys know that, though they may not have to risk tripping up the stairs to the stage in front of packed pews in Laidlaw on the way to shaking his hand, they can still earn the palm in innumerable ways. Although this can’t be re-iterated enough, I hope that I have provided some fodder for discussing alternative pathways to meritorious enlightenment. The simple foundation of the chief UCC symbol, “Palmam Qui Meruit Ferat“ has the power and scope to push us to tap our latent potentials and, in the jussive subjunctive, I say let it do just that. Josh Suteir is a graduate of Queen’s Engineering and studied Science Education at OISE/UT. He teaches Chemistry at Upper Canada College and coaches basketball, tennis, and the Reach for the Top team. An advocate for furthering public understanding of science, he has also been an educator at the Ontario Science Centre and Royal Ontario Museum. This entry was posted in Uncategorized on February 6, 2013 by jjacobson2012. Or something you simply inherit?